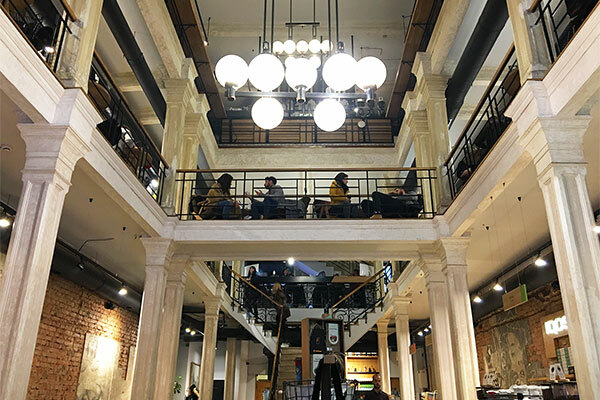 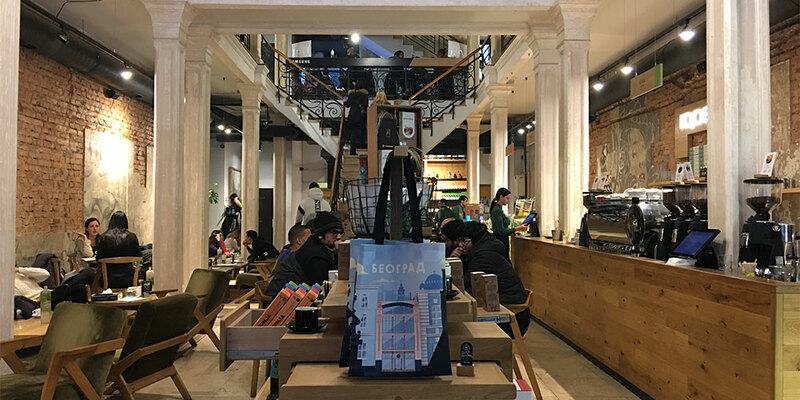 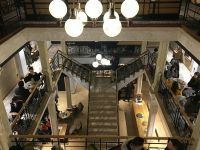 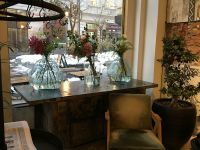 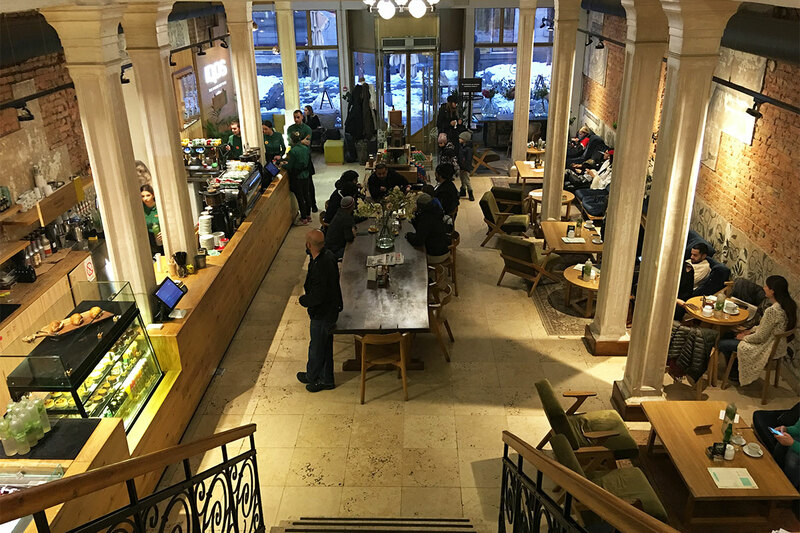 Whilst roaming Belgrade’s main pedestrian and shopping zone of Knez Mihajlova, Blenheim Designers were looking for a shelter from the snow and somewhere to refresh and warm up between meetings. 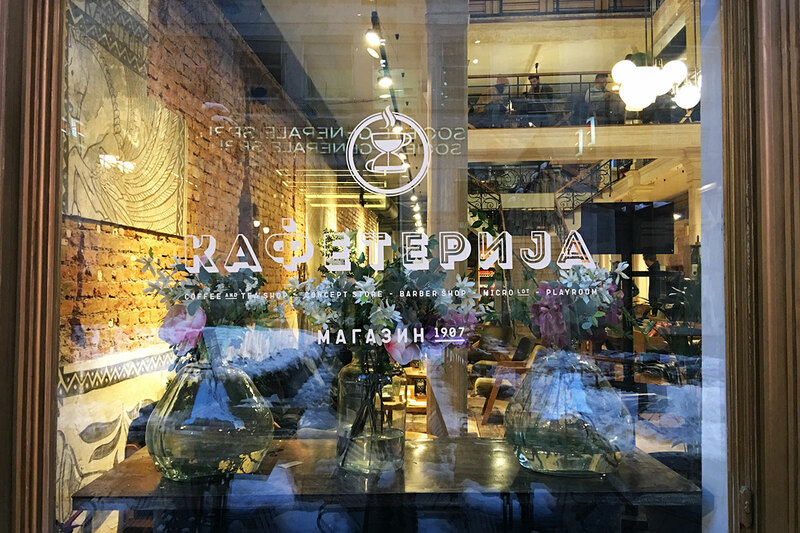 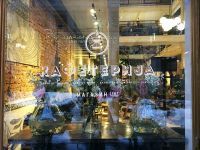 After turning the corner into Kralj Petar Ulica, warmly illuminated interior of a trendy coffee shop Kafeterija looked promising. 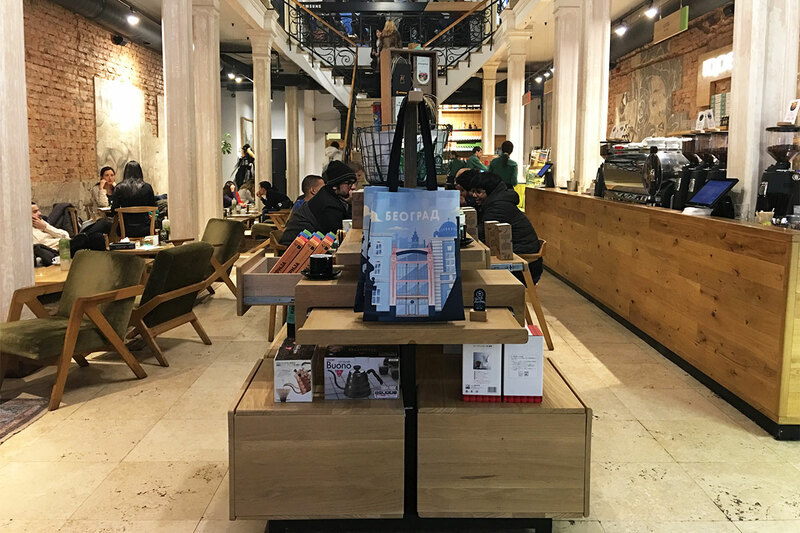 Striking impression upon walking into this trendy shop is how open and airy it feels. 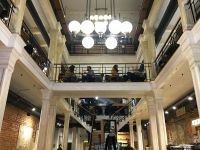 Original staircase and balconies have been restored whilst the unique bronze and opal globe light feature draw an eye to the top floor and revealing floors to explore. 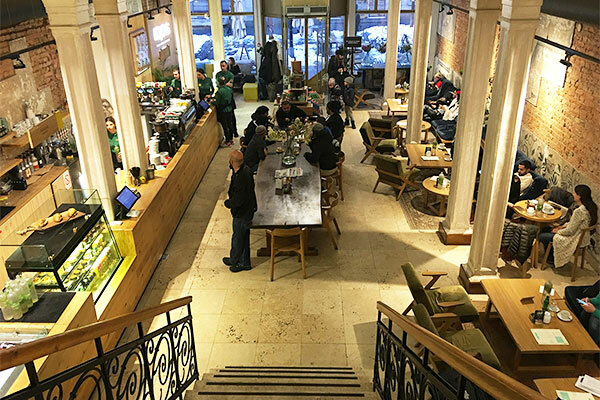 We had to stay and get coffee from knowledgeable and pleasant staff. 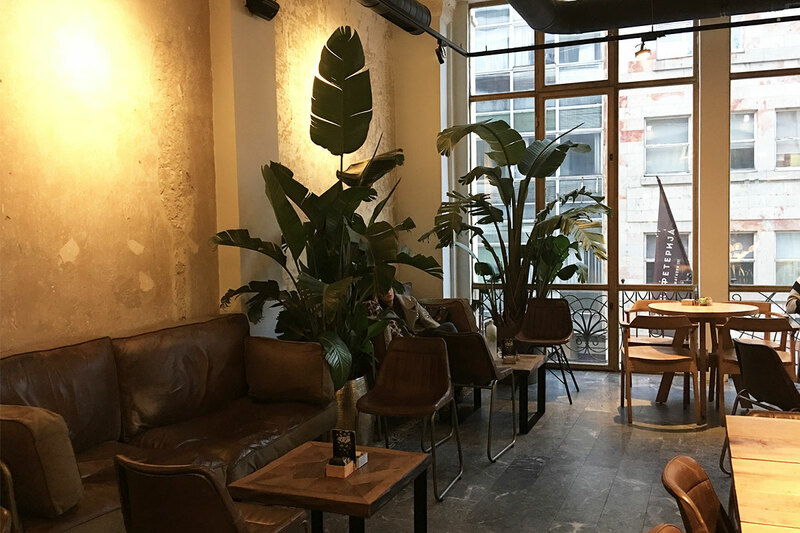 Warm and inviting interior of this coffee shop is bang on trend. Comfortable sofas and coffee group pods are differentiated by loose rugs sitting on the tiled floor with old brick walls adding to the sense of home atmosphere. 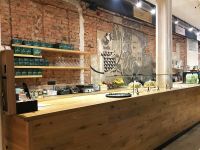 Large timber clad bar unfolds against the side wall across the whole length of the café. 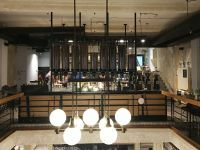 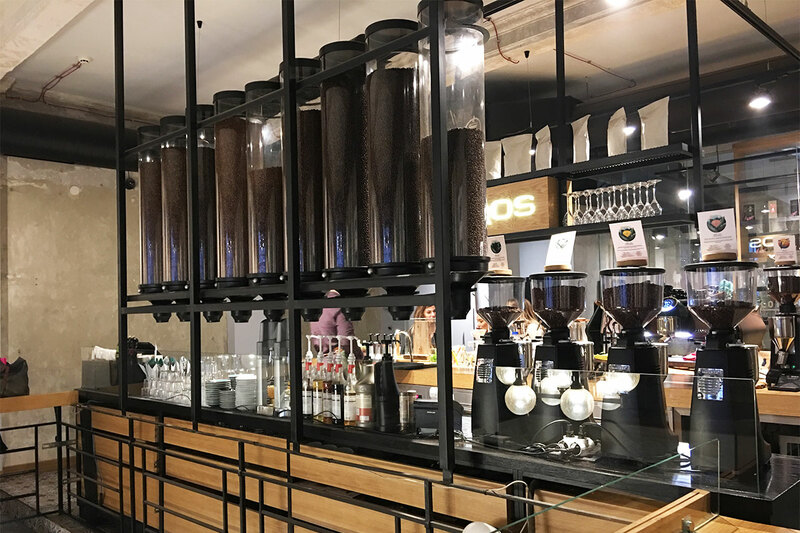 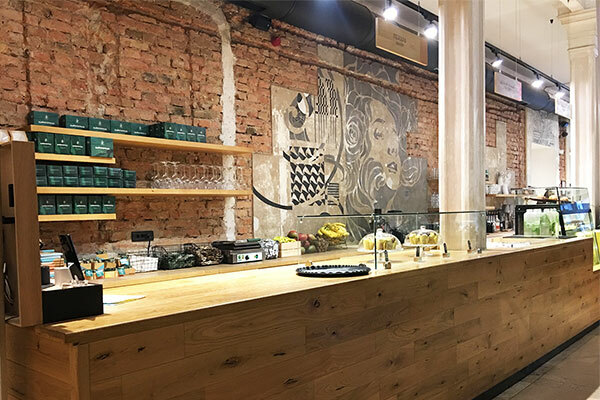 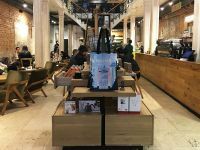 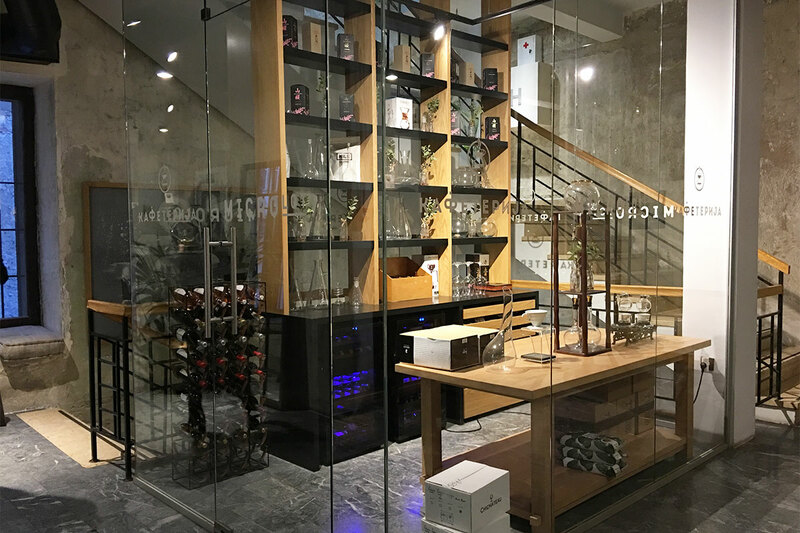 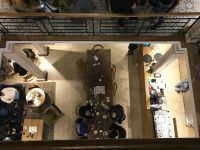 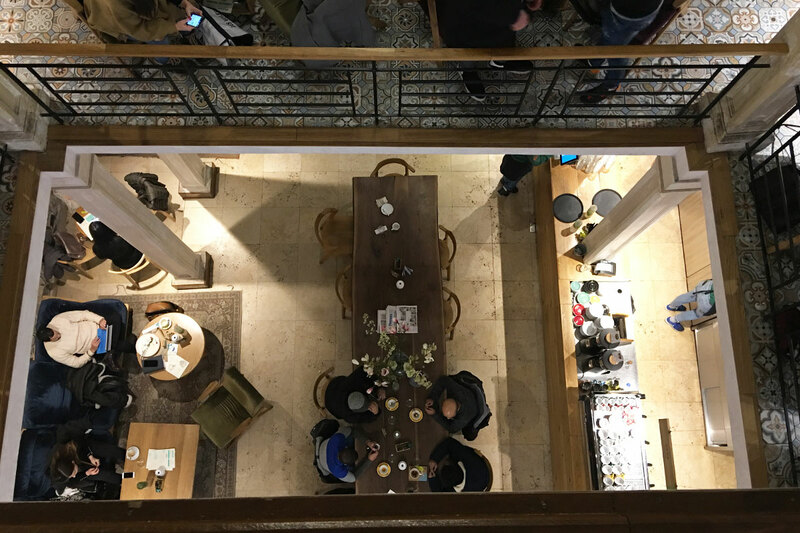 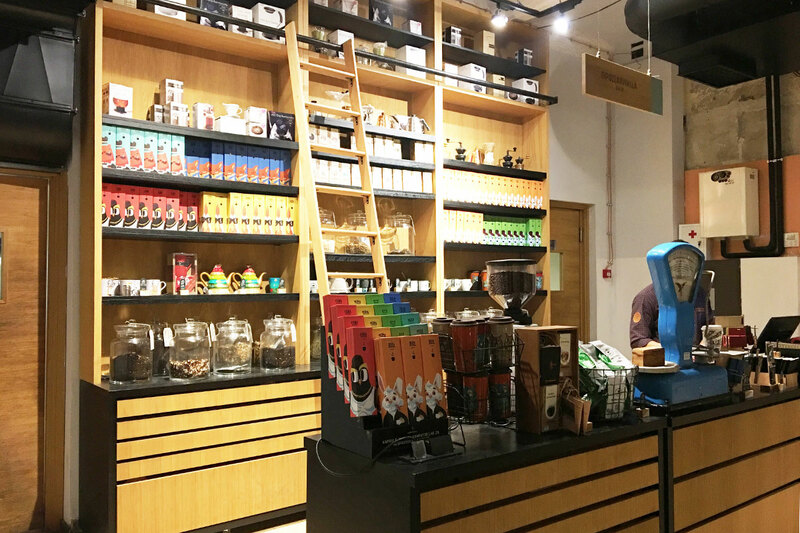 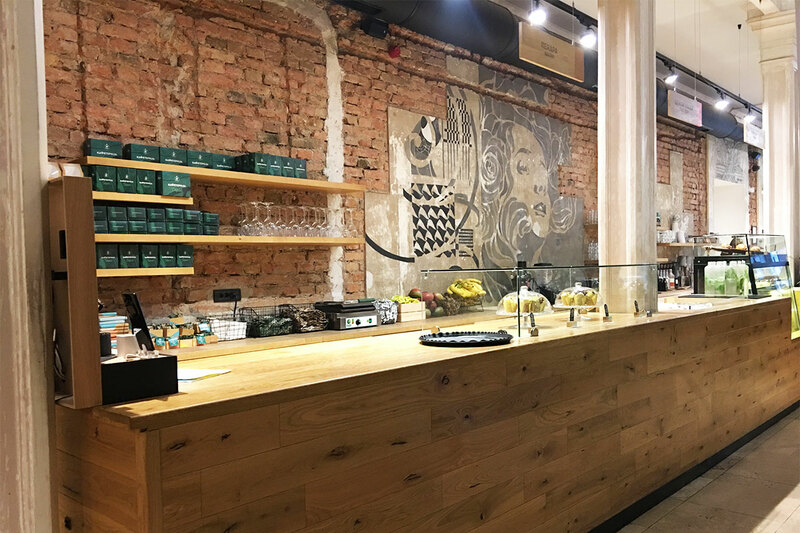 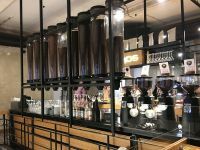 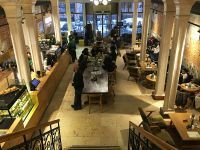 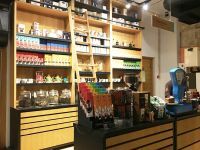 Although very large, the counter is not the dominant feature, this was reserved for the stunning original staircase leading up to further 3 floors entirely populated by purveyors of fine coffee. 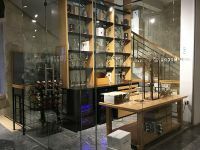 Natural materials have been used throughout with an odd interruption of glass screens and cement tiles. 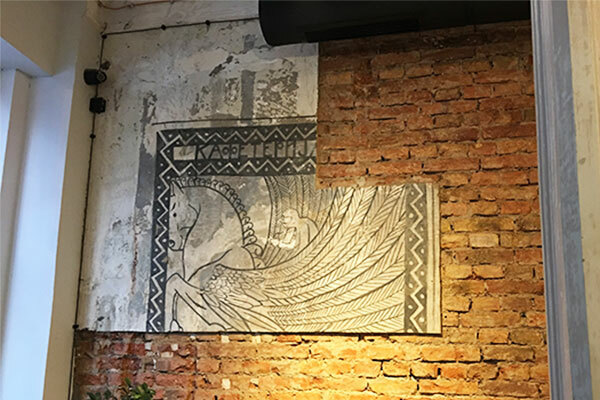 Remnants of the concrete clad walls have been illustrated by the Kafeteria owners own handy work. 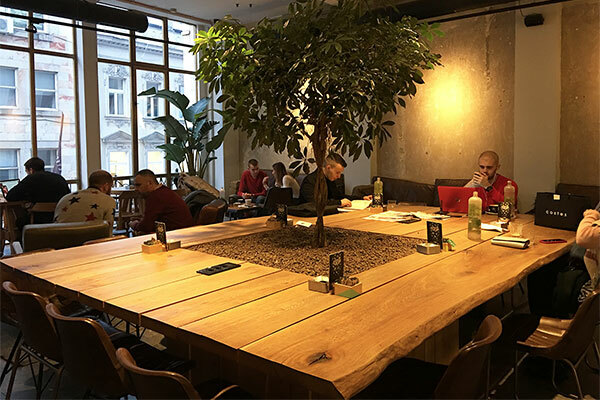 Café Interior Architects used natural, honest and raw materials. 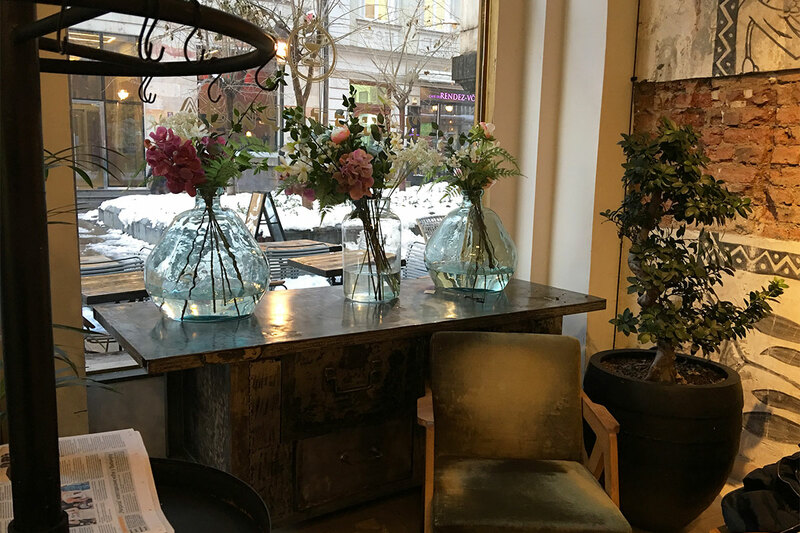 Metal and concrete elements add to an industrial feel whilst feminine softness comes from exposed oak, leather and flowers and lighting. 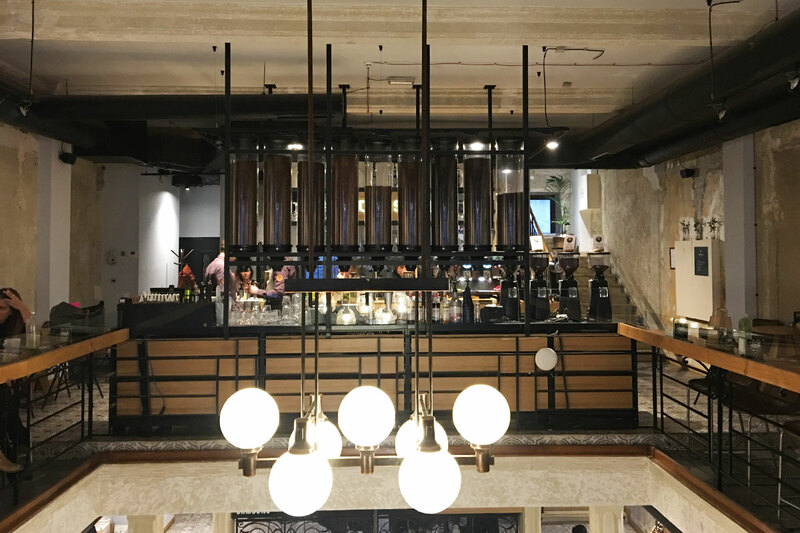 Many details, carefully dotted around the space add interest to every view or the corner. 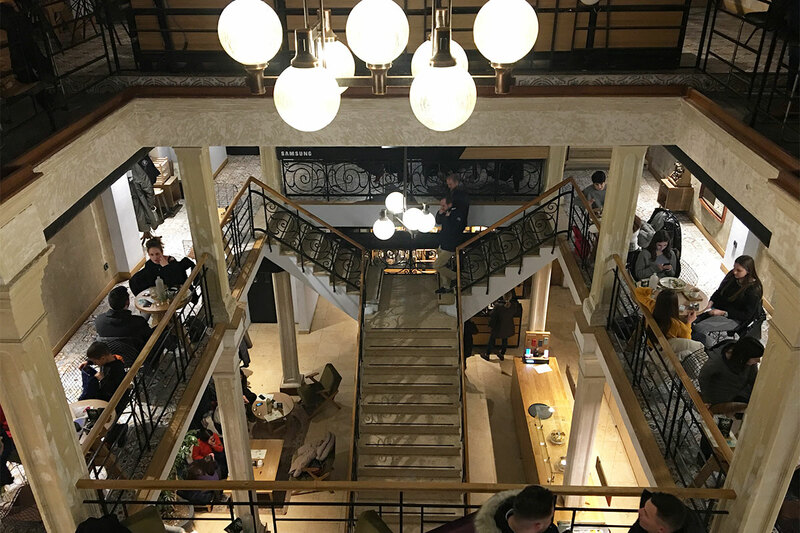 Tables of two are strategically placed around the balustrade, making it the best place for people watching. 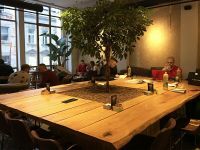 Large communal table, cantered around the tree is perfect space for individual customers to sit with the laptop. 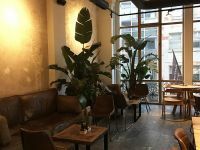 Space caters for individuals and large parties. 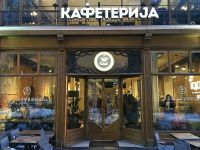 We loved this café; however we did not like the smoke of the cigarettes, still very popular and permitted in public spaces around Beograd.